Are you looking for a free WAV to MP3 converter to convert a WAV file to MP3 format? In this article, we will show you the best WAV to MP3 converter software that you can download. 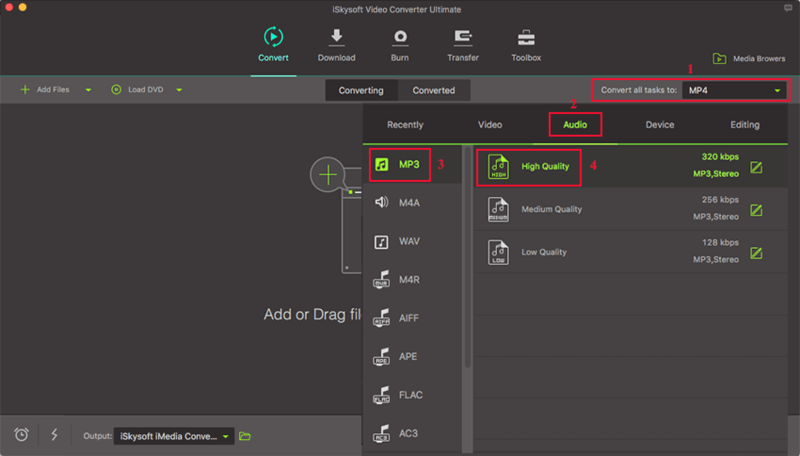 The best WAV to MP3 Converter that has a free trial version is iSkysoft Video Converter Ultimate. 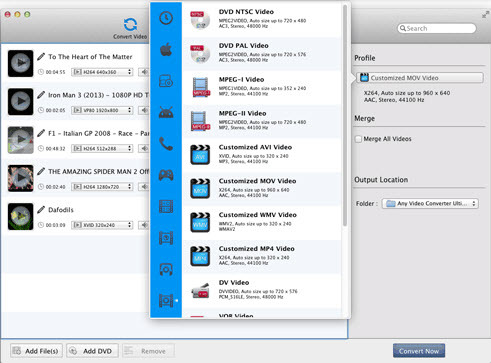 This software is an audio converter that supports different input and output video formats. You can input formats like WAV, MP3, APE, MKA, AU, FLAC, CAF and output file formats like MP3, AAC, OGG, M4A, APE SD2 and AIFF. As you convert the files, you will be able to output high-quality audios. It supports over 150 video and audio formats, including MP4, AVI, FLV, MOV, M4V, WAV, MP3, WMA, etc. The user interface of this software is simple, and the conversion process is fast since it built with Intel and NVIDIA hardware accelerator. It can edit videos by adding subtitles, watermarks, and effects, adjusting brightness, volume, contrast, contrast and saturation. With the editing tool you can also trim, crop, rotate and merge. It is a versatile tool that can convert audio and video files to device formats such as Gear VR, Oculus Rift, Vive, iOS devices, Android phones and many more. 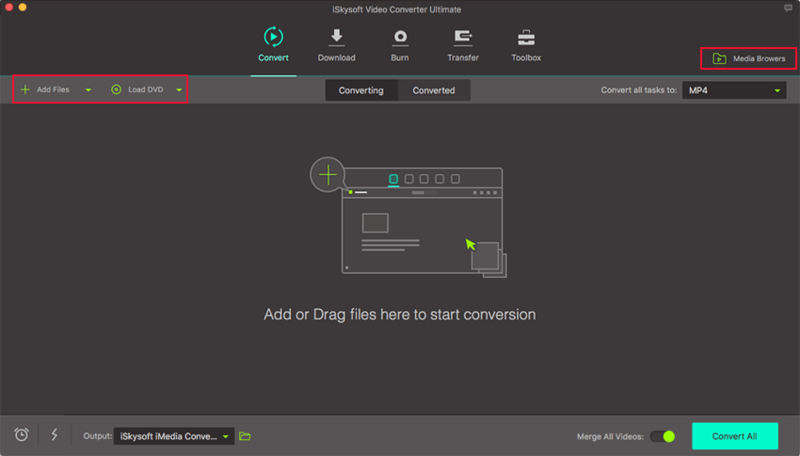 iSkysoft Video Converter Ultimate can convert DVD file formats, edit them and burn media files to DVD formats due to its inbuilt DVD toolkit. It supports DVD file formats, which are: DVD folders, DVD disc, DVD ISO and DVD IFO file. 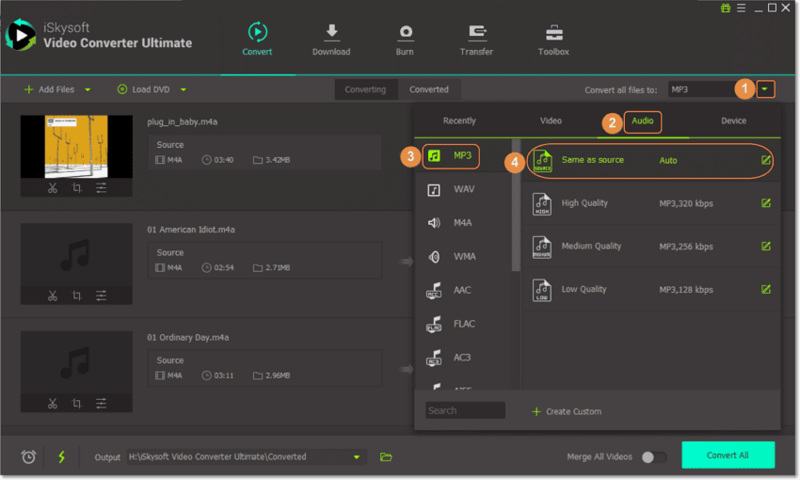 It is a video downloader and recorder that support many websites like Vevo, YouTube, Hulu, AoI, Break, Blip, Videobash, Facebook and much more. Here we prepare both video and step-by-step tutorial for your guidance, you can watch the video below to get a quick glimpse over how to convert WAV to MP3 format and then follow the detailed instructions to get started. Open the program and click “Add File” button to upload WAV file from your computer. You can also drag and drop file. Next click on “Output Format” and click on “Audios” and then select “MP3” format. From there choose the output destination for your file. Now, click on “Convert All” icon at the lower right and the program will begin to convert your file immediately. Once the conversion is done you can now open your MP3 file. This is another free WAV to MP3 converter that you can download. 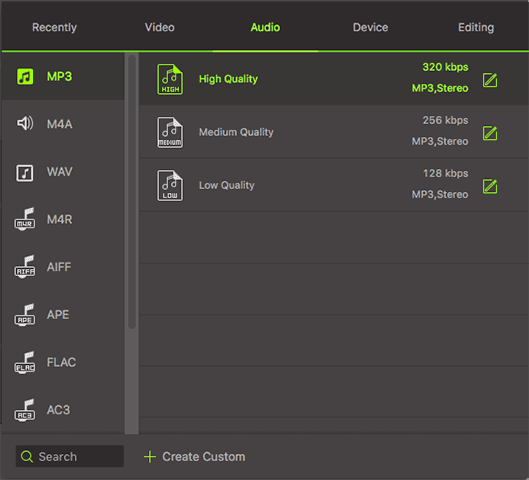 It supports different audio formats like WAVWMA, OGG, APE, DTS, M4R, AC3, MP3, FLAC, AMR, AIFF, MP2 and others. It can convert audios in a batch to your device without any data loss. It supports over 50 audio formats. It allow you to upload music to iOS device, Google Drive and Dropbox. It edits video bitrates, sample rate, channels and audio codec. It only supports Windows OS. Switch MP3 converter is a product of NCH software. It supports conversion of WAV to MP3 format. Other supported formats are AAC, OCG, WMA, M4A and AAC just to name a few. 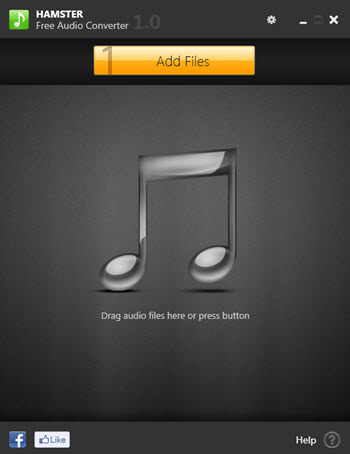 It can also extract MP3 file from videos other than allowing you to play the audio files. It can compress audio files. It supports batch audio conversion. It can edit audio bitrate. It supports both Mac and Windows OS. It does not support conversion of audios to devices. 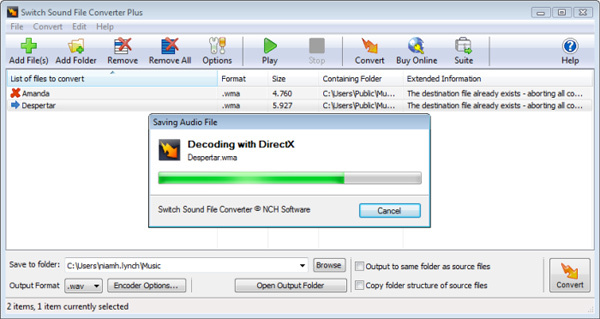 Boxoft is another freeware audio converter that supports conversion of WAV to MP3 format. It can convert files on Mac and Windows OS. It lacks online audio downloader or extractor. Hamster Free Audio converter is another converter that cannot miss on our list. It converts audio from different file formats to other audio formats and devices. 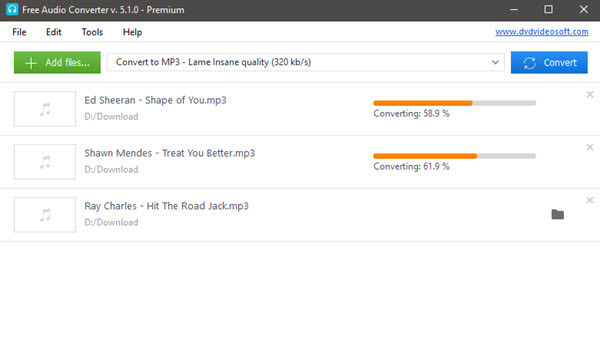 It can also download files from YouTube and convert them quickly. It popular file formats including WAV, MP3, AAC and others. It can convert audio to more than 200 devices. It cannot edit audio bitrate. ShuangSoft is also a freeware audio converter that supports formats like MP3, WAV, WMA and OGG. It can converts WAV file to MP3. It does not support Windows 8 and 10. With Free audio converter you will be able to convert audio files from WAV to MP3 file formats. 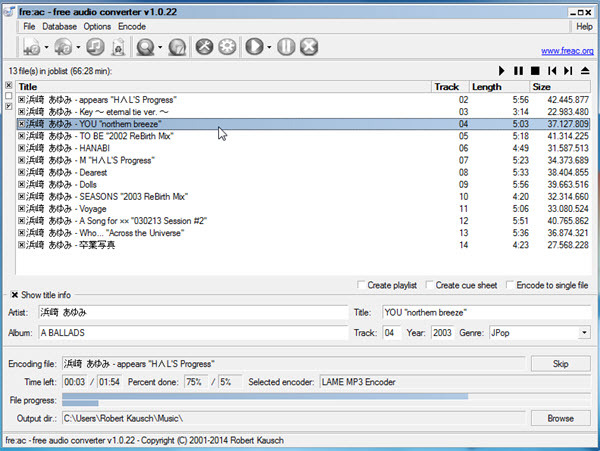 It supports other formats like M4A, AAC, FLAC and Bonk formats. It is built with CD ripper. Any Audio Converter allows you to convert audios, download audios from YouTube, extract audios from videos and personalize audios. It supports popular audio formats like MP3, WAV, AAC, M4A and others. It downloads audios from YouTube and converts them. It supports limited web sharing sites. 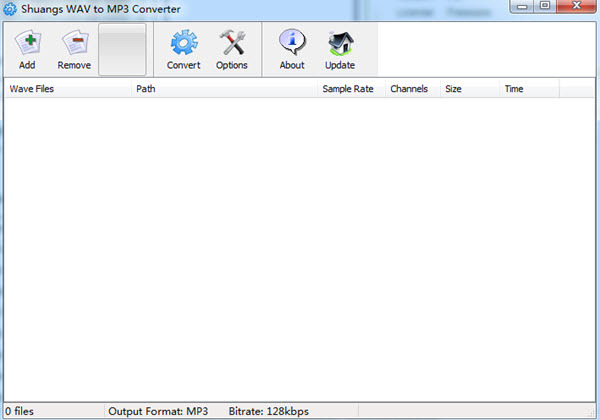 DVDvideosoft also has an audio converter that refers it as the superior MP3 creator. It supports formats like WAV, APE, M4A, M4B and others. It supports lossless audio conversion. 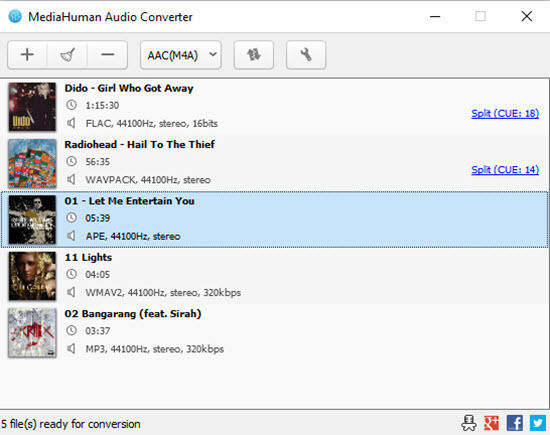 With Media Human Audio converter, you can convert WAV file to MP3, OGG, AIFF, OGG and FLAC formats. It converts audio files while maintaining its folder format. This software creates audios by extracting them from video files. It has simplified user interface. It supports Apple lossless formats. It supports audio limited formats.